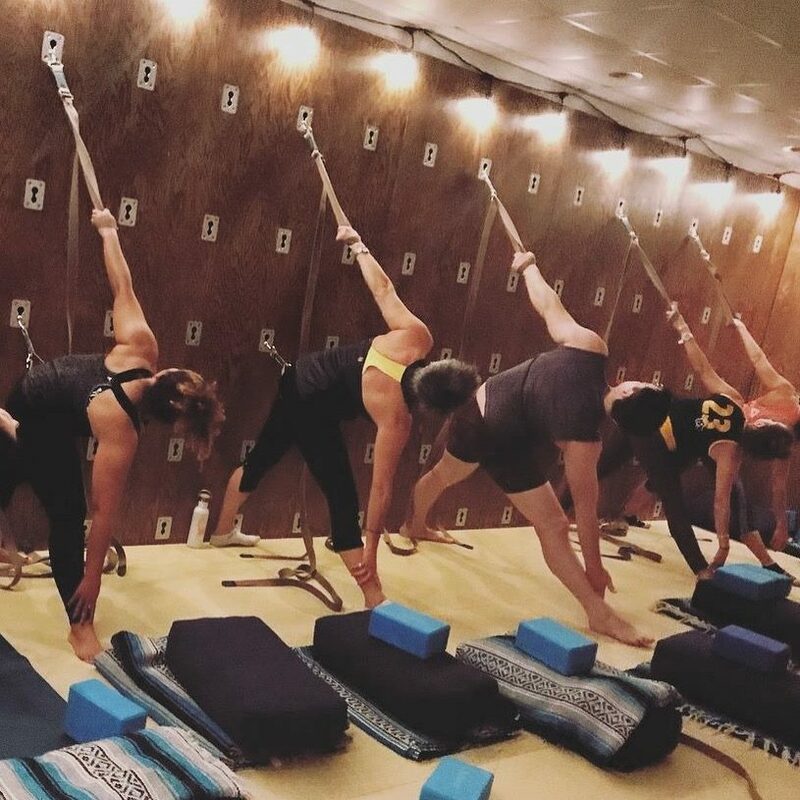 Yoga walls (also called rope walls) are beneficial for all levels of practitioners, from beginners to advanced, and can also provide amazing support for people who are working with injuries. First, the wall helps you lengthen your spine and decompress your joints. Second, it allows you to increase strength by working with gravity and your body weight in new ways. And for the more intermediate/advanced practitioner, a yoga wall can really help you with your inversions. By allowing you to be inverted with full support, the wall will help you get more comfortable going and being upside down which can help practitioners move more confidently into unsupported inversions). Hot Yoga classes are our mainstay at MYBO. These yoga classes are intended to support your practice and your individual efforts to find balance, detoxify, and re-energize. Expect to get sweaty! Our classes range from warm to hot (80 to 106 degrees). The heat + humidity allow the body to detox and stretch more slowly, safely, and deeply. With sustained practice, you’ll start to notice more rapid improvement with healing, detoxification, weight loss, flexibility, strength, endurance, balance, and concentration. Practice often (we recommend a minimum of three days per week)! You can be a beginner and take any Hot Hatha Class! The heat and the mental aspect is more challenging than the poses. Expect to see your body, attitude and energy positively transform. We recommend that you drink at least 1-2 liters of room temperature water 30 to 60 minutes before attending class and avoid eating large meals for two hours prior to class. It is advised that you snack on something small to eat like fruit, protein bar, or smoothie to maintain your energy level throughout the class. If you have health conditions, ask your doctor if you should take Hot Yoga. Through creative vinyasa sequencing, conscious alignment, breath awareness, meditation and relaxation, we bring you Hot Oasis Flow, MYBO’s signature Vinyasa class in 90-95 degrees. With sequencing honored in every class as we move through the asanas (poses), there is an organic unfolding where each step prepares us for the next. Our monthly yogic themes begin each class and are infused throughout along with musical playlists to inspire movement, contemplation and joy. Every class begins with OM, breath centered gentle warm-ups, sun salutations, and has elements of creative standing pose sequences, powerful arm balances and inversions, heart opening backbends, detoxing twists, deep forward folds and hip openers, along with meditation. Each session concludes in blissful relaxation, with cooling and calming minty essential oil towels. Moving gracefully through a set sequence of standing, balancing and seated postures, including basic inversions and hip openers, the Hot Hatha Variations class is an all levels class designed to encourage proper alignment of the body and bring balance, strength, and a calm mind. Similar to Bikram Yoga in that it is practiced in 103-105 degrees with 50-60% humidity, we begin and end with breathing technique. Our Hot Hatha focus is on endurance, focus, precision and breath. The sequence will not change much week to week, so you can start to learn the series and gauge your progress. This is not a “flow” class: expect a steady pace, longer holds, just enough breath, and some use of props to assist a posture or maximize a stretch. Modifications offered to meet student’s needs. Come heal your back, shoulders, knees and ankles. Begin the healthy steps to realign your joints, tissues, ligaments, tendons as well as purge out toxins with the generous sweat created in class. Reminder: Take as many rest breaks as you want, drink water as much as you want between poses, and, most importantly have fun, detox, sweat it out, and get rid of your physical and emotional limitations and baggage through this practice. *These classes are not Bikram Yoga and our studio is not Bikram affiliated. Moving at a slower pace with less heat, the intro class is also a great class for those dealing with injury, who would benefit from modifications to postures in the sequence. Also serves as a great prenatal class! Appropriate and beneficial as well for more advanced students to slow down the practice, focus on alignment and breath, and practice mindfulness of movement at a slower pace in a less hot room. Through creative vinyasa sequencing, conscious alignment, breath awareness, meditation and relaxation, we bring you Oasis Flow, MYBO’s signature non-heated Vinyasa class. With sequencing honored in every class as we move through the asanas (poses), there is an organic unfolding where each step prepares us for the next. Our monthly yogic themes begin each class and are infused throughout along with musical playlists to inspire movement, contemplation and joy. Every class begins with OM, breath centered gentle warm-ups, sun salutations, and has elements of creative standing pose sequences, powerful arm balances and inversions, heart opening backbends, detoxing twists, deep forward folds and hip openers, along with meditation. Each session concludes in blissful relaxation, with essential oils. A restorative class and is the practice of entering Yoga postures (Warm is done in 80-90 degree heat) using an assortment of props: blankets, bolsters, blocks, straps, walls, chairs, eye pillows etc. Supported and passive yoga postures allow the body to naturally release, letting go of held tension and stress. With great precision you will be guided into position with a deep understanding of anatomy to restore healthy alignment. This support and stability invokes a restful state of healing, renewal, and equanimity. Gentle Therapeutics Yoga is a life enhancing practice and is appropriate for anyone at any age or stage of life and in any physical condition. Even those with an active, dynamic practice will benefit greatly from the inner peace, rejuvenation, and deep release created through this style of yoga. Let your body and mind relax and renew in this Oasis Restorative class. Accessible for any age, level, and physical ability, this class prioritizes the use of props and supported postures that are designed to calm the nervous system and let your muscles release. The poses draw focus on stretching the connective tissue such as the hips, thighs, and lower spine. This is achieved through longer, slower movements to ease into the poses. This class is ideal for anyone in need of stillness, relaxation, and peace. Appropriate and beneficial as well for more advanced students to slow down the practice, focus on breath and the practice of mindfulness of movement at a slower pace. We all know that any real program designed to make a serious change must go straight to the core! Mat Pilates classes strengthen and tone all of the body’s core muscles through targeted exercises which challenge the student to focus on specific muscle groups. With practice, students will soon build tremendous core strength. Strong core muscles support the spine, reduce back pain, add an amazing new depth to yoga practice, and are an integral component of athletic performance as well as everyday balance. Pilates Mat Fusion steps up traditional Mat Pilates to provide a cardiovascular workout. It targets the bigger muscle groups in the lower body with standing balance exercises as well as ring work. Beginners and more experienced Pilates students can enjoy and benefit from this class! All levels welcome. Barre classes are simply ballet-inspired, and mixed elements of Pilates, dance, yoga and functional training,. Barre’s tiny motions, many reps, intentional squeezes and pulses (otherwise known as isometric moves) are designed to fatigue muscles to failure. Embrace the shaking as it’s totally natural for your muscles to quiver uncontrollably. 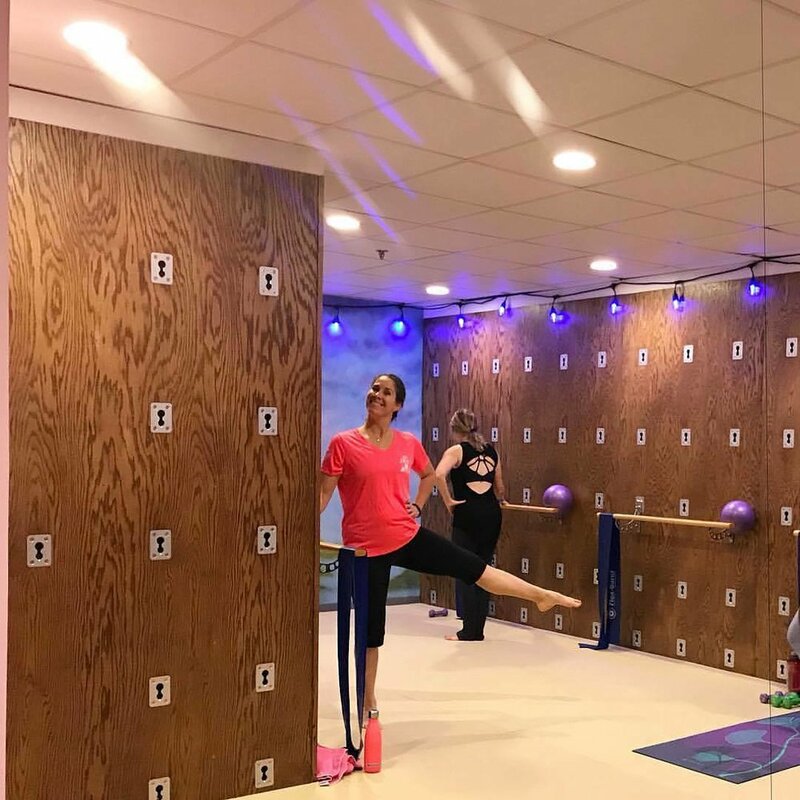 In each energizing and targeted workout, you’ll use the barre and exercise equipment such as mini-balls and small hand weights to sculpt, slim and stretch your entire body. Modification are available for every age and level and no experience required. Here are 5 reasons to try a barre workout! Hard on muscles, kind on joints. Increased flexibility, greater range of motion.